For years, the rich have been using their personal connections and vast wealth to continue bringing in opportunities for their lackluster children, yet for some reason, no one seems to bat an eye. Wealthy people are paying for their kids to get into college? Honestly, tell me something I don't know. On Tuesday, the FBI exposed a multimillion-dollar college admissions scam executed by some of the most wealthy and prominent families in the U.S., two of which happen to be Hollywood household names. These overzealous and exceedingly wealthy parents participated in scandalous and unethical behavior, such as paying others to take their teen's admissions exams, as well as bribing college officials to say that their children were athletic recruits when they weren't athletes at all. The most notable names from the list of 50 individuals charged are Lori Laughlin, former cast member of TV's "Full House," and Felicity Huffman, known for her role in "Desperate Housewives" as Lynette Scavo. These women appeared innocent on TV, but it's clear that the cookie-cutter demeanor their characters displayed couldn't be further from their true colors. If we're being honest here, the only reason this is newsworthy is that the wealthy people being indicted are celebrities — not because college admissions scams are a new occurrence. It's no surprise that the colleges where these scams have taken place have all been prestigious universities like Yale, Stanford, and UCLA. These institutions have a history of being exclusive, as well as placing money above intellect and ability. As the saying goes, "It's not about what you know, but who you know." For years, people have been using their personal connections and vast wealth to continue bringing in opportunities for their lackluster children, yet for some reason, no one seems to bat an eye. We all know it's going on, but no one is complaining and no one tries to stop it. It's almost as if we've just accepted that that's the way things are. Meanwhile, I hear at least one ignorant comment about affirmative action a year. I'm being serious. It's like clockwork. As a minority, you constantly feel as though you have to "prove" that you belong in certain spaces, especially those that are typically seen as reserved for the white, wealthy majority. With this country's history of limiting minorities' access to education, colleges and universities are definitely included in the list of those spaces. The idea that we don't belong in these spaces, nor are we good enough for them, is still highly prominent in our society, even though there have been vast increases in the percentage of minorities enrolled in postsecondary education. As a minority student, your talents and abilities are constantly undermined, while your success is seen as the result of some type of "help." Even though the majority of minority students busted their asses to get into college (and bust our asses every day to stay there), we are always verbally assaulted with the "affirmative action" slander. I once went to see a lecture by a distinguished marine biologist. He told us a story about someone harassing him during the early days of his career, telling him "it's because of affirmative action and people like you that I didn't get into [Harvard]." In 2008, a clueless and grossly privileged young white woman tried to sue the University of Texas for using affirmative action to discriminate against her (but the truth is that she was just a mediocre student). And for a personal example, I once sat across from one of my peers at the Honors College and heard him say "I have to look super good on my med school application or else I won't get in... Because, ya know, I'm white." The idea that the only reason Blacks and other minorities receive opportunities is because of affirmative action needs to die. Not only is it the furthest thing from the truth, but it is just another way to denigrate an entire group of people and diminish their accomplishments. Why are minorities always blamed when a white person doesn't receive the opportunity they think they deserve? The same people who think it's preposterous to say that white privilege exists are the same people claiming how "unfair" affirmative action is. The truth of the matter is that affirmative action is not some sort of privilege to minorities (Blacks are still the smallest population of those currently attending college), and minorities aren't "stealing" opportunities from anyone. 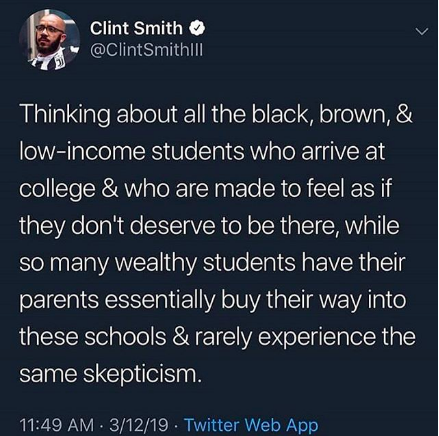 Perhaps if we acknowledged that the biggest threat to integrity in college admissions are wealthy and elite, we could end this tired debate around affirmative action and stop the actually mediocre kids from getting into colleges they don't deserve to attend.